Misc. Games · Game Collections. Deep Lift ... All games are copyright © their respective authors. myspace visitor counter. 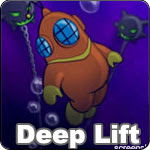 Deep Lift - Navigate the treacherous underwater station in search of your lost wrench. Navigate the treacherous underwater station in search of your lost wrench. Run forward and jump at the right time to clear the gap to the next platform. Press the right arrow key to start running. Press up to initiate the jump, press up again to set the direction and push off.Press the right arrow key in-between platforms to swim. Collect life power ups if you can, you might need them later.